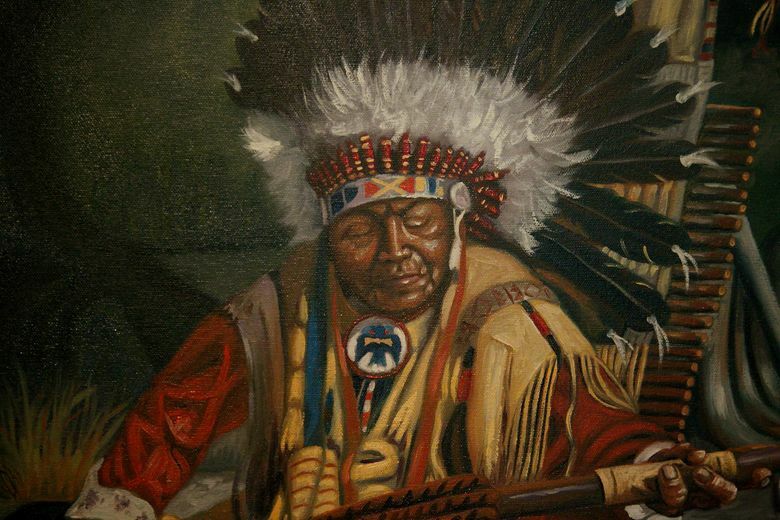 A Washington state agency stumbled into a battle over the legacy of Leonard Peltier when it displayed paintings by the Native American activist and convicted murderer. OLYMPIA — They were pieces of art depicting simple scenes. A young Native American man riding a calf. A portrait of a chief. Cultural artifacts. A buffalo. 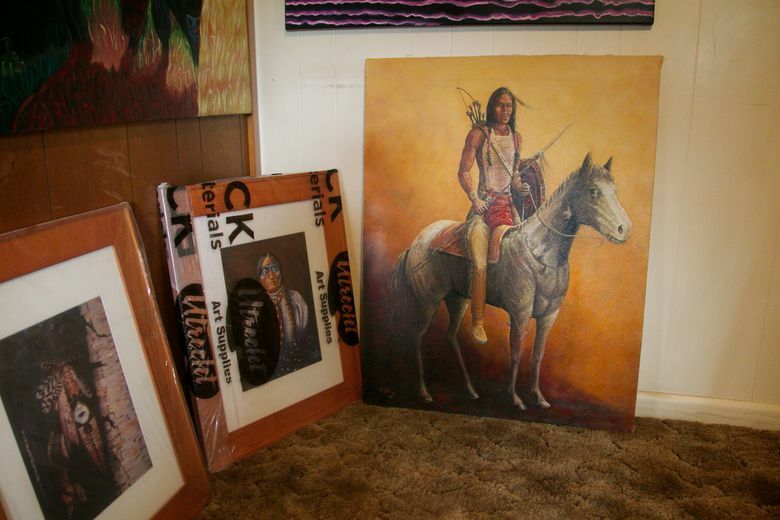 Yet when the Washington state Department of Labor & Industries (L & I) briefly displayed the four paintings in 2015, the agency stumbled into a larger battle over the legacy of the man who created them: Leonard Peltier. A jury in 1977 convicted Peltier, an American Indian Movement activist, for the murder of two FBI special agents a few years earlier on South Dakota’s Pine Ridge Indian Reservation. He remains in prison. Depending on who you ask, Peltier is either a convicted cop-killer or a scapegoat who signifies government oppression against Native Americans. Fast-forward to the 2015 art display at L & I headquarters, part of a wider celebration of Native American Heritage Month. Peltier’s art drew some complaints, including letters to Gov. Jay Inslee and L & I Director Joel Sacks by a pair of former FBI agents. 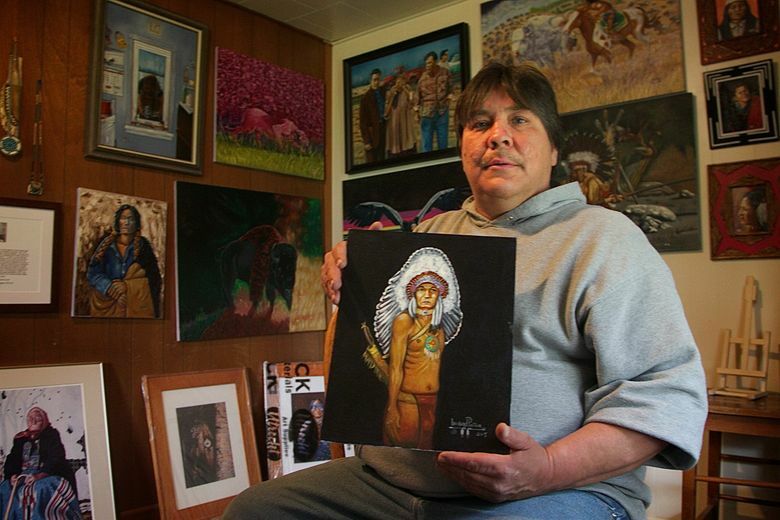 L & I officials then pulled down Peltier’s artwork two weeks early. In response, Peltier and his son Chauncey this spring filed a lawsuit in federal court against L & I officials, Inslee and the two agents, saying removal of the art infringed on Peltier’s First Amendment rights, among other claims. In a ruling handed down last week, U.S. District Judge Ronald Leighton dismissed a portion of the Peltiers’ lawsuit aimed at silencing the two agents who complained. The Peltiers’ claims against the governor and L & I officials had been placed on hold pending the outcome of the motion to dismiss by the agents. Now, the lawsuit — and the long-running fight over Peltier’s convictions for the murders — continues. “From Mr. Peltier’s point of view, and his supporters, he is innocent and what he was doing was being active and supporting Indian rights and trying to advance tribal sovereignty,” said Frank Pommersheim, a law professor at University of South Dakota and tribal appellate judge. In 1975, FBI Special Agents Jack Coler and Ron Williams died in a hail of bullets on the Pine Ridge reservation. 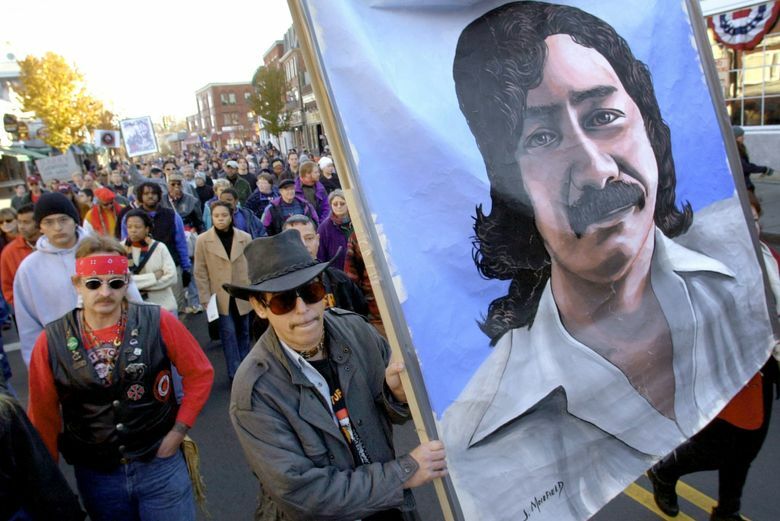 Edward Woods and Larry Langberg — the retired agents dismissed from the lawsuit — have dogged Peltier since his conviction 40 years ago, using any opportunity to remind the public that the Native American activist was convicted of the killings. Woods operates a website and blog, the No Parole for Peltier Association, which keeps a running clock of the time elapsed since the agents died. When Peltier’s paintings went on display at L & I, Woods wrote Inslee seeking their removal. In the meantime, Langberg, president of the Society of Former Special Agents of the FBI, wrote a similar letter to L & I Director Joel Sacks. Sacks and the agency’s public-information officer, Timothy Church, are both named as defendants in the Peltiers’ lawsuit. Woods, Langberg and others have moved to block every effort by Peltier to seek parole or clemency, which was denied by former President Barack Obama as one of his final acts in office. Peltier is currently held at the high-security Federal Correctional Institution in Coleman, Florida. Two others were acquitted and a third had charges dismissed in connection with the deaths of Williams and Coler. In a conviction that has been questioned by some, including Amnesty International, Peltier was sentenced to two consecutive life terms. 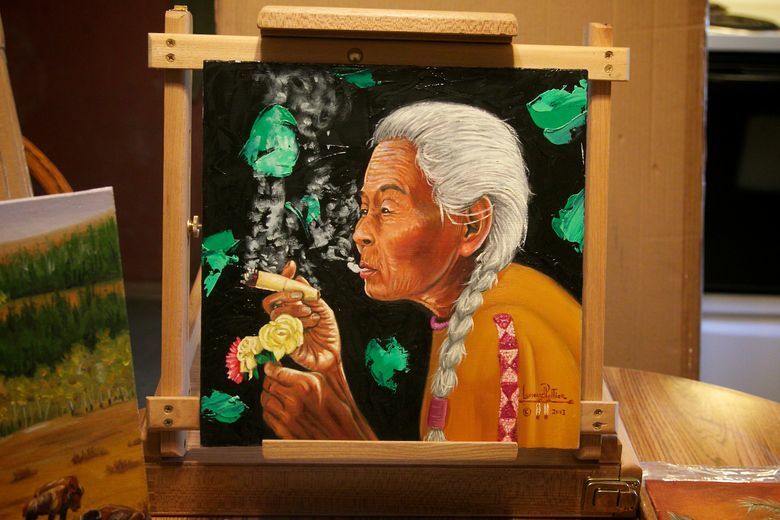 Chauncey Peltier, also a plaintiff, is a caretaker of his father’s art in Oregon. In an interview, Chauncy, who helps run a website, Peltier Justice for All, repeated claims that his father is innocent. He accused Woods and Langberg of harassing his family and said that because of the controversy, he has “been shooed away a lot of times” from displaying his father’s art. Besides, “No matter who you are or what you did, you have the right to show your art,” Chauncey, 51, said. In his ruling, Leighton found that the agents prevailed both under federal civil rules and the state’s so-called anti-SLAPP law. That statute is aimed at preventing what are called Strategic Lawsuits Against Public Participation (SLAPP), which are suits that are intended to censor or quiet critics in public discussions. The judge pointed out that Wood and Langberg “each communicated his displeasure with L & I’s public display of Peltier’s artwork, as it seemed to condone his murderous past,” which was protected speech. The anti-SLAPP law provides for penalties of up to $10,000 and requires an offender to pay the other party’s defense costs. Leighton ordered the Peltiers’ to pay the agents’ expenses and fees but declined to impose the statutory penalty, pointing out that there was no evidence Peltier had acted with malice in filing the lawsuit. Moreover, the judge said in a footnote, the agents don’t deserve it. “It is ironic that Woods and Langberg seek a statutory award protecting their free speech against Peltier, who is also attempting to exercise his right to free expression,” Leighton wrote. “The display of artwork, and the free-flowing discourse and the debate around it, enriches our culture and elevates our society,” the judge wrote. Meanwhile, state officials argue that neither Sacks nor Inslee made the decision to remove the paintings. A L & I deputy director who is not named in the lawsuit ultimately made the decision to remove them from the display, according to an agency spokeswoman. “We stand by our decision to remove the paintings, and we look forward to having this resolved in court,” L & I spokeswoman Kimberly Contris wrote in a statement. Even with Woods and Langberg dismissed from the lawsuit, Chauncey Peltier said he remains undeterred. “I have talked to my attorney and said we’re going to push forward,” he said.